McIntosh, Jason, Chuck Toporek and Chris Stone. Mac OSX in a Nutshell: a Desktop Quick Reference. O'Reilly; Sebastopol, CA. 801pp. US$34.95. Pogue, David. OSX: The Missing Manual. Pogue Press/O'Reilly; Sebastopol, CA. 713pp. US$29.95. Pogue, David. Switching to the Mac: The Missing Manual. Pogue Press/O'Reilly; Sebastopol, CA. 435pp. US$24.95. If you read the back page of the Sunday Bangkok Post's Opinion section, Roger Crutchley had a laugh at the expense of those people who shut themselves away for the Songkran Festival. On the Friday before this year's hostilities, I dashed to the World Trade Centre, bought groceries for two weeks, returned home and locked the gate, only to emerge on Wednesday morning. To save myself from the Thai version of cabin fever, I had the movies on UBC and a selection of books to read. It is 12 months since starting eXtensions in Post Database with 3 book reviews on OSX, so it seems apt to take time out and look at some new offerings from O'Reilly, the publisher specialising in IT. They have a good selection of books at the high level, particularly Mac, Linux and UNIX. 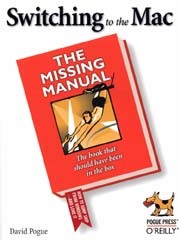 My favourite from that first review was David Pogue's Mac OSX: The Missing Manual. It is perfect, therefore, that this column examines the Second Edition of this valuable book. OSX has evolved from an emerging operating system, with a few problems and idiosyncrasies, with a completely new edition, often called Jaguar, to a powerful alternative to more widely spread systems. Pogue's work covers this new version completely and is not, therefore, simply a re-edition of the same material. Many sections have been rewritten, with several being completely new. Apple claimed 150 new features; but, claims Pogue, "Apple undercounted." The Missing Manual is in six major sections: Desktop, explaining the file and folder organisations; Applications, and how to use them; Components, which includes working with the system and the free programs; Technologies -- looking deeper into what happens under the hood; Online working, ranging from mail and Internet to setting up firewalls and web-servers; and Appendices with other valuable information on installation and trouble-shooting. Clearly set out, with slightly rough paper, the second Edition follows an identical format to its earlier cousin. It is well-written with a touch of humour. Throughout the book, there are clear grayscale illustrations adding to the ease of understanding. Pogue never descends to patronisation. The book also has littered throughout its length black panels with hints and tips -- an appendix on almost every page. 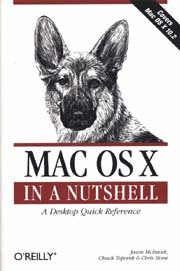 The book is aimed at Mac users with a fair ability -- perhaps used to System 9 or earlier -- or those who had been using 10.0.x or 10.1 and need to come up to speed on the latest changes. Not that it is entirely up to date. Neither The Missing Manual, nor OSX In a Nutshell (below) could be. As they arrived in my mailbox, OSX was updated to 10.2.4 and as I start writing the review, 10.2.5 was downloaded. Changes to OSX have been either subtle improvements and so nothing is lost, or technologies in beta (the Safari browser, X11 windows) and not officially stable. If I were to recommend one book for someone wanting to learn how to use OSX effectively, The Missing Manual would be it. There comes a time when a user who is interested in getting the most out of a computer, needs more information. Despite a common misconception, the iMac on my desk is not a toy. A remarkable evolution has taken place with Mac users worldwide with the access to UNIX. While Pogue has "Fun with UNIX" in a little over 20 pages, for example; Mac OSX In a Nutshell, uses over 200 pages. We are working with the plumbing here. The authors set the tone in a Preface. Referring to The Missing manual, they suggest that the "Nutshell" series "takes a more terse approach" using "as few words as possible." The subtitle also helps position the book as a "desktop quick reference" and suggest it is for the "poweruser" (sic). 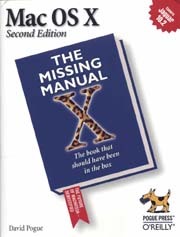 Like The Missing Manual, there are five sections plus appendices: The Lay of the Land, looking at the operating system; System Configuration, including system preferences, applications, networking and printing, and Java; System and Network Administration; Scripting and Development; and Under Mac OSX's Hood, which examines the UNIX underpinnings of OSX and includes -- most valuable this -- almost 300 UNIX commands. Although throughout the book there are brief explanations of the processes involved, the strength of this work -- as a reference -- is the lists of commands and ways to control the OS in every chapter. Even as a fairly long-time user of Macs, I am surprised by just how many commands exist. OSX in a Nutshell, is particularly strong (as intended) when dealing with scripting and the UNIX, with clear explanations of many of the functions included: for example emacs and vi, although nothing on pico. Like The Missing Manual, there are plenty of grayscale illustrations, and plenty of tips throughout. I found a couple of problems with the text, however. I am being picky when I say that I do not like contractions in writing; but I find that these detract from the quality that this book otherwise exhibits. Many readers will not notice. Slang terms, too, may not worry many readers -- particularly if they add to better understanding. What I did find disconcerting was the number of proof-reading errors. Examples I found were "acorss" (P203), "authenticaionlock" (for authenticationlock) on page 204; and "agaist" (rather than against) three times on P346. most of these should have been caught by a spell-checker, which (as I tell my students) is a free go that everyone should try. These are minor quibbles in what is a strong and valuable book for those willing to take advantage of the Mac and examine its full potential as a powerful (and relatively cheap) UNIX machine. I have a theory that many regular users of earlier Mac operating systems were tripping over themselves when it came to OSX because the whole operating system had grown and matured. Mac OSX in a Nutshell puts that view firmly in perspective and demonstrates what a powerful system users now have at their fingertips. It is recognisably Mac, but (if you want) it is demonstrably UNIX as well. Both of these works contain sections on additional outside resources. They are highly recommended for anyone with an interest in USING a computer, rather than just using it. But what about those folks trying to escape the Limbo of Windows? . . . Although the campaign suggested that all you had to do was pick up a Mac and enter computing heaven, the reality is that differences do cause problems for many who would otherwise make the leap. Pogue's approach to this is totally realistic and he admits that it is not 100% smooth. By following The Missing Manual, there will be fewer tears. The book is not party-line Mac. Although obviously Pogue is pro-Mac he is not anti-Windows. The Missing Manual clearly demonstrates the differences -- sometimes with side-by-side illustrations, sometimes with comparitive lists -- in operations, file types and usage. Thet text is as clear as other works in The Missing Manual series, with ever that welcome touch of humor: nice, but neither patronising nor flippant. The first section, Welcome to Macintosh, examines the system's operational differences. This is followed by a lengthy section -- Moving In -- which discusses transferring files and using e-mail. This also has a large section on software, with a back-to-back comparison of programs used in Windows and on the Mac. Most, of course, are the same. Two that are not -- Encarta and Access -- are covered, with alternative means of working. On games, Pogue is honest: "Nobody swtiches to the Mac to play games: of the top 250 computer games for Windows, only about 150 are available for the Mac." If you listen to the doom merchants, they suggest that nothing is available and this is quite wrong. If all else fails, says Pogue, try Virtual PC: run Windows inside the Mac OS. "Moving In" also examines hardware (for example printing, scanning, CDROMs, DVDs). Other sections are on the Internet and making connections, including firewalls and ethernet links; and a section called "Putting Down Roots" which delves deeper into the system itself and looks at working with a number of common applications found on Macs. Appendices cover Installation and Troubleshooting; a "Dictionary" called "Where's it Go?" that compares Windows and Mac operations; and finally a Keystroke list for OSX. Switching to the Mac is in Pogue's highly readable style, which makes it both a book to read through (then go and try) and one of those useful books that stays beside the computer as a handy reference. These three books contain excellent indexes, making searching for information relatively easy. Athough there is some information in the Troubleshooting section, Switching to the Mac might benefit from a list of further resources (in the other books here). All may be ordered from online resources such as O'Reilly's own website or retailers such as Amazon . It is possible to order them from local retailers but the time for an order to arrive is unpredicatable. In recent trips round Bangkok, I have seen none of these on sale: most books cover OSX 10.1.x and are out of date. Additional note: As always happens, I was told after the review that Mac in a Nutshell and OSX: The Missing Manual had been spotted in Kinokuniya books in The Emporium. Kinokuniya in the World Trade Center does not have these.